I love this particular outfit featured at Pure Collection. It’s comfy, stylish and ready for work. The only change I’d make would be the shoes – lower heels in leopard print! Each piece is highly versatile to easily incorporate into your existing wardrobe. 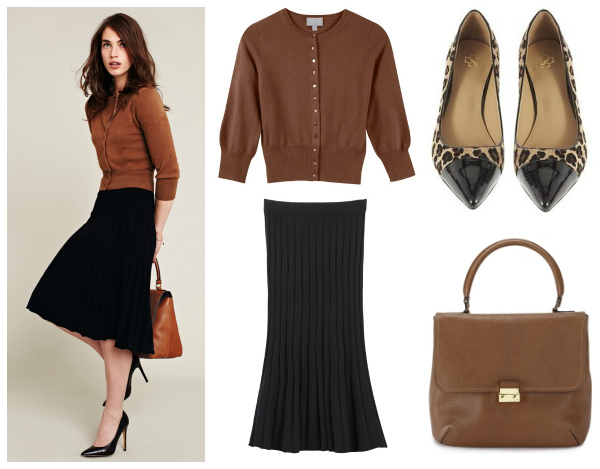 Cashmere Cropped Round Neck Cardigan – A perfect cardigan to enjoy as a top. Available in 10 colors. Knitted Full Skirt – Luxe, cozy fabric along with the flattering A-line shape making it a seasonal must! Available in 3 colors. Eryn Captoe Leopard Print Haircalf Heels – Leopard print is always in. This polished captoe pump will put a little glam in your strut! The Portand – Cherish this timeless style for your day-to-day, season after season. In black or cognac.